(CNN) -- The doctor of Nobel Prize-winning democracy activist Aung San Suu Kyi was barred from seeing her on Saturday, a spokesman for her party told CNN. The Myanmar opposition leader is showing signs of dehydration and low blood pressure, Nyan Win said her doctor found. The doctor put her on an intravenous drip Friday, Nyan Win said, but it was not clear what the IV was providing. 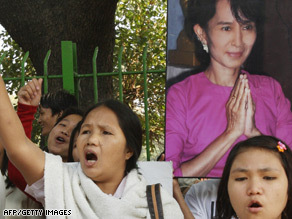 He urged Myanmar's military rulers to allow the doctor access to Suu Kyi as soon as possible. It remains unclear why the doctor -- who is not her regular physician -- is being barred from seeing her. The arrest of the doctor followed the detention Wednesday of an American man who apparently swam across a lake to gain access to Suu Kyi's house. Nyan Win said he did not have many details about the incident. Myanmar's government has scheduled elections for next year that it says will lead the nation toward democracy. Human-rights organizations have said the vote will merely extend military rule in the nation.